The winter, and even much of the spring, can lead to a high heating bill. No matter what type of heating system you have, cold days and nights typically mean more work for the system, especially if you have an older system or blockages in the system are making it inefficient. 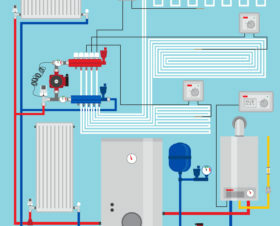 There are a lot of ways you can save money on your heating bill. Perhaps the most straightforward – but also the most expensive in the short term – is to replace your old system with a new, efficient system. When this is not an option, consider doing one or more of the following to get some relief on your next utility bill. Just like air vents can become blocked with debris, your furnace works less efficiently when it is becomes dirty and blocked. Having your heating system serviced regularly will keep it running efficiently, because at each service visit, the HVAC professional will clean out your furnace and vents. Your furnace should be serviced at least once each year. Ceiling fans circulate the air in your home. Hot air rises, leaving cooler air below. To keep that hot air down where you need it, run your ceiling fans in reverse (clockwise) to prevent it from rising by pushing it downward. If you have windows that face the sun, keep your curtains open during the day to allow the sun’s rays to enter through your windows and keep your home warm. At night, close the curtains to keep the sunlight trapped inside. This will make a small, but noticeable, difference in your home’s temperature. Different levels of insulation are recommended for different regions of the United States. Use the Department of Energy’s website to determine how much insulation your home needs. If you live in an older home, you might not have as much insulation as the Department of Energy currently recommends. Install new insulation to bring it up to par and keep more heat in your home, putting less strain on your heating system. As you can see, most of these tips rely on using your heating system less and finding other ways to keep your home warm. An obvious way to save money on your heating bill is to turn down the thermostat and keep the house a few degrees cooler. To make up for the discomfort this can cause, bundle up in warm clothing and thick socks. Consider keeping certain areas of the home warmer while turning down the thermostat in areas you do not use much, like a guest room. When you have questions about your heating system and how to keep your home warm efficiently, speak with an experienced HVAC professional. Contact our team at Naughton Mechanical LLC today to set up your consultation with a member of our team.